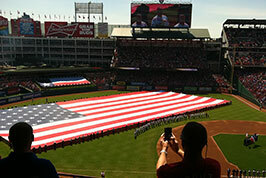 SuiteHop is your resource for experiencing the best events in the metroplex. Ready to start planning your next suite event? Select a venue below to learn more. 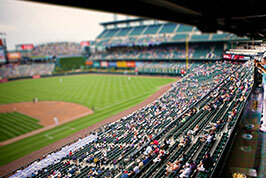 The roar of the crowd, the crack of the bat and your brand name up in lights. 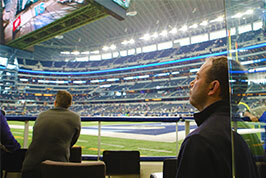 Luxury suite events will positively associate your brand with the best performers and teams in Dallas, creating an experience your guests will talk about for years to come. 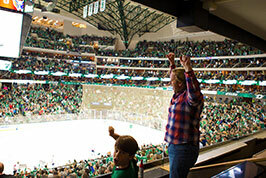 As the first online marketplace for suites, SuiteHop provides live pricing and availability for Dallas Cowboys Suites, American Airlines Center Suites, Dallas Mavericks Suites, Dallas Stars Suites and more. 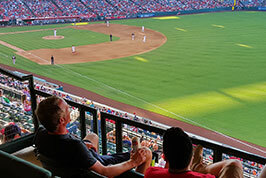 With two of the four Dallas venues centrally located in Arlington, Texas, planning a corporate event at AT&T Stadium or Globe Life Park means guests from Fort Worth and throughout North Texas can easily attend. Both venues are minutes from Highway 36 and easy parking access offers a wide variety of options for your guests to arrive with ease. 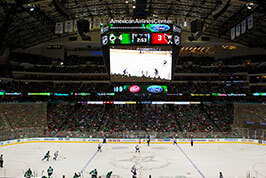 American Airlines Center is located off Highway 35E on the north side of Dallas. Corporate event goers commuting from downtown will have easy access to the venue for Dallas Mavericks and Stars games. There are over 5,000 parking spots and the Victory DART station within walking distance of the venue. SuiteHop has planned over 500 corporate events throughout Dallas. We are your guide for entertaining in the DFW area. Our team of suite experts will walk you through the event planning experience from start to finish. Select the venue you'd like to entertain at, and we'll provide our expertise helping locate a suite that aligns with your budget and goals! SuiteHop is your partner for corporate entertaining. 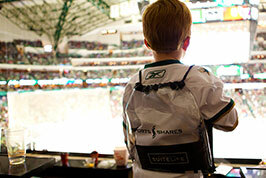 Want to learn more about hosting suite events in Dallas? Fill out the form below or call us at 1-844-784-8346. We look forward to hearing from you! 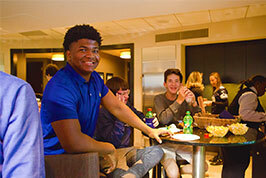 Looking for a Dallas Cowboys Suite? Field level is the way to go! You can’t get any closer to the action than standing on the field. These suites include private bathrooms and can seat between 20 - 40 guests per event. 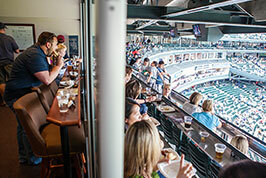 Located above the 100 level of the stadium, Hall of Fame Suites provide the best view of the game or show. Dallas Cowboys suites on the Hall of Fame level seat 20-30 guests and may include access to the Legends Club on this level. 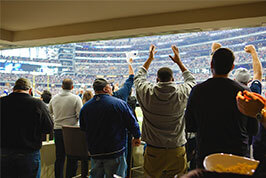 Silver Level Suites are located above the 300 level of the stadium and provide 360 degrees of viewing options. 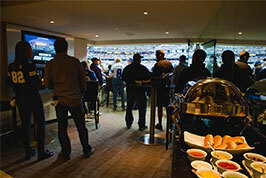 Dallas Cowboys suites on the Silver Level seat 18-30 guests. 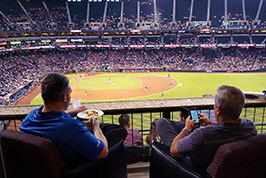 The two highest levels of suites in the stadium, guests on these levels will experience premium views of the entire field. 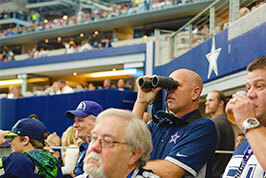 Dallas Cowboys suites on the Ring of Honor and Star Level seat 18-30 guests. 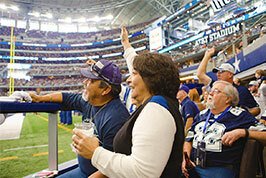 There are over 300 AT&T stadium suites and SuiteHop has access the best locations in the stadium Experience legendary catering, private VIP parking and exclusive sightlines when you book your Cowboys suite with SuiteHop. 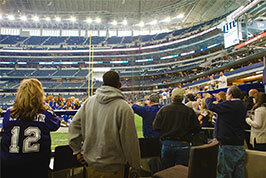 AT&T Stadium is home to the Dallas Cowboys and hosts dozens of special events and concerts throughout the year. 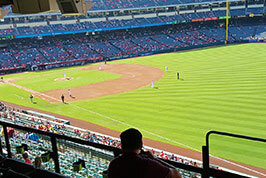 The lower level of Globe Life Park features 58 Texas Rangers Suites, seating up to 18 guests. 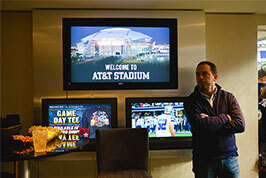 This level of suites is located above the 100 level section of the stadium and includes a private in-suite restroom. 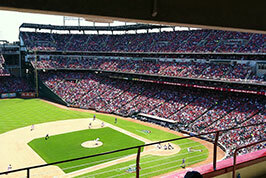 The upper level of Globe Life Park features 69 upper level Texas Rangers Suites, seating up to 18 guests for events. All suites on this level include access to in-suite restrooms. 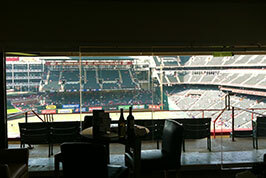 With the ability to seat groups 30 - 120, Texas Ranger Party Suites are ideal for corporate events of all sizes. 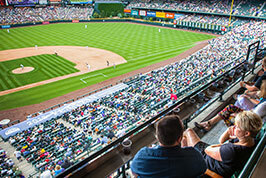 Party Suites typically include an all-inclusive menu, with ballpark favorites, soft drinks and beer. Globe Life Park is home to the Texas Rangers. In the heat of the summer there is no better way to experience a ballgame than in the climate-controlled luxury of a Texas Rangers suite. Suites at Globe Life Park are available in a wide variety of sizes, starting at 20 guests and going up to 120 for large corporate events. Give us your information and we'll help you find a suite! This semi-private area features luxurious leather seating, shielded from the Dallas sun and center stage sight lines for the show. Each seat includes access to dedicated wait staff prepared to bring food and drink directly to your seat within minutes of your request! 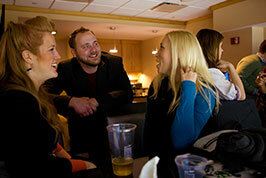 VIP Box Seats includes access to the Live Nation Lounge where you will enjoy a full bar and air conditioning. With cabana style seating this private area is an exclusive place for you to enjoy your favorite performers in style. Catering can be preordered and guests will enjoy an amazing view for the show from covered seating and access to the air conditioned Live Nation Lounge. When the best concerts and tours come through Dallas, they stop at Dos Equis Pavilion. This intimate venue is the best way to experience live music and SuiteHop has access to exclusive VIP areas you won’t find anywhere else. Sit in one of the cush VIP seats and enjoy the best sightlines and access to the in-suite wait service, air conditioned club and premium bathrooms. 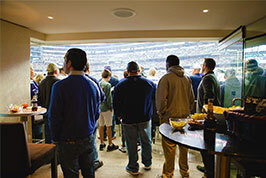 Flagship suites at AAC are located above the 100 level and include access to private suite level bars and restaurants. This level is closest to the action and if you look closely at your neighbors, you may be surprised to witness a sea of famous faces among the crowd. 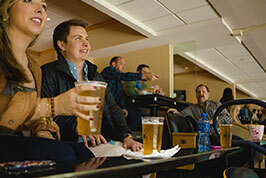 These premium suites include VIP entrances, top notch catering and seat up to 18 guests. 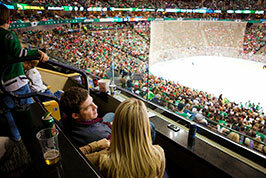 Platinum Level suites seat between 12 and 22 guests for Dallas Stars and Dallas Mavericks games. This level is located on the north side of venue and provides access to the suite level bars and restaurants. 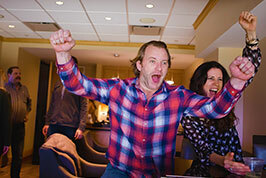 American Airlines Center Suites on the Admiral Level are the highest level of suites in the arena. 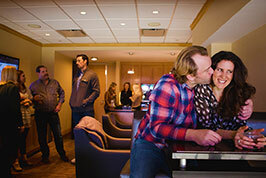 The Admiral Level is home to private suites that seat up to 32 guests or theatre boxes that seat 4-12 guests. Theatre boxes are semi-private areas with seating in the Service King Lounge. 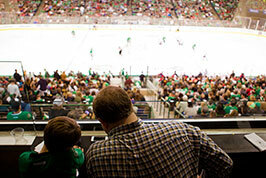 With over 150 events each year, American Airlines Center is the ideal location for your next corporate event. 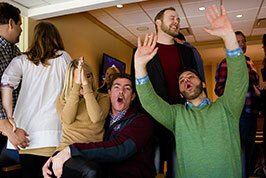 Let your guests live like Mark Cuban and experience the Suite Life for a Dallas Mavericks or Stars game this fall.